After viewing LCA's undercover footage, the Nongan Animal Health Bureau (AHB) in Northern China forced the closure of the Zhao Zhiyong and Wangyajun dog meat slaughterhouses. LCA's Special Investigations Team is working full time on shutting down China's dog meat industry. After viewing LCA's undercover footage, the Nongan Animal Health Bureau (AHB) in Northern China forced the closure of the Zhao Zhiyong and Wangyajun dog meat slaughterhouses. LCA's team continues to monitor these slaughterhouses as they try to reopen, and is gathering evidence to close down more facilities. Watch LCA's video, narrated by Academy award-winner Kim Basinger, which shows the brutal inner workings of some of China's largest dog meat slaughterhouses. 1. 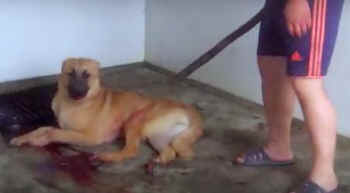 Help stop China's dog meat industry; learn more at StopDogMeat.com; stay informed and educate others. 2. 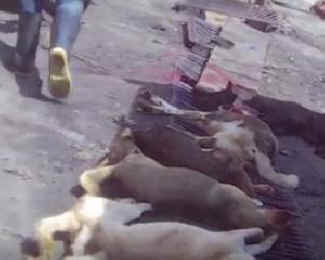 SIGN and SHARE the petition at StopDogMeat.com urging Chinese Officials to pass an animal cruelty law to help end the suffering of dogs and provide protection to other animals in China. 3. Make a donation. Last Chance for Animals (LCA) is in the field gathering evidence to expose more dog slaughterhouses and have them shut down....we can't do this without your support.